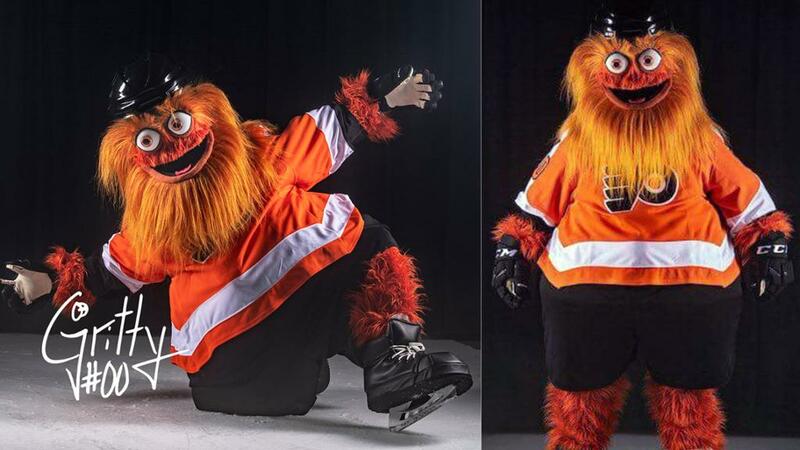 BREAKING NEWS: After failing to find employment on Sesame Street, or with the Muppets, and having never heard back from Jeff Dunham; Gritty, the large, orange… thing, finds a new home with the Philadelphia Flyers. An appropriate fit, as the mascot bares a striking resemblance to Danny DeVito from It’s Always Sunny in Philadelphia. Uncanny, isn’t it? They could be twins. But seriously folks, this is Gritty. Gritty is the Flyers’ new mascot. The Flyers haven’t had a mascot in a long time, and ironically enough, their last ones’ name was Slapshot. Little is known about what happened to Slapshot of Philly, but despite his disarming appearance, one certainly can’t hope the same fate befalls Gritty. I mean, we hardly know the guy. But you know how the internet is. Let’s take a look at some knee-jerk reactions to this big, orange fella. They said the Eagles winning the Super Bowl would be the greatest day in the history of Philadelphia sports. BUUUUUURN! Oh man, I actually laughed at loud at that last one, myself. But it isn’t all bad. They say all you need in life is a few good friends; that those who mind don’t matter and those who matter don’t mind. So things are on the up and up for Gritty despite facing critical backlash in his first few hours in the public eye. The rest of the NHL mascots seem to be very happy to have a new friend in the “Furturnity”, and many of them have publicly praised Gritty and welcomed him to the community. Despite representing different teams, all the mascots appear to be good friends, and are a subtle reminder that we’re all hockey fans before teams divide us. In a day and age wherein Cyberbullying is at an all-time high and peoples’ opinions are torn apart for no good reason other than the party listening disagreeing with them, the mascots’ acceptance of Gritty was a breath of fresh air. For starters, our own Slapshot made friends with his division rival using a knee slapper of a pun. First day in the league and already stealing my dance moves?! It would appear Iceburgh, on the other hand, isn’t as amused with Gritty as the rest of the NHL Mascot Gang. The Flyers are currently undergoing a rebuild phase, and despite this, are pretty good. Good enough, that is, to make it into the playoffs despite labeling themselves a rebuilding team. Gritty might not be an essential part of the team’s success, but his presence will be felt everywhere in the Wells Fargo Center this coming season, and his attempts to boost team morale just might help the Flyers bring some more excitement to the city of brotherly love in the future. Welcome to the league, Gritty. We hope you find your legs soon. This entry was posted in News and tagged Arizona Coyotes, Carolina Hurricanes, Columbus Blue Jackets, Dallas Stars, Florida Panthers, Mascots, Philadelphia Flyers, Pittsburgh Penguins, San Jose Sharks, Slapshot, Vancouver Canucks, Washington Capitals, Wells Fargo Center. Bookmark the permalink. What the hell even is that thing? This has to be a publicity stunt…..like “New Coke”.